Year Two at Good Chemistry Brewing! Tomorrow we celebrate two years since we got the keys to the big old warehouse we now lovingly call GCHQ. It’s been an incredible adventure so far, and we’re really looking forward to partying at the brewery with lots of friends, family, customers, suppliers and colleagues. 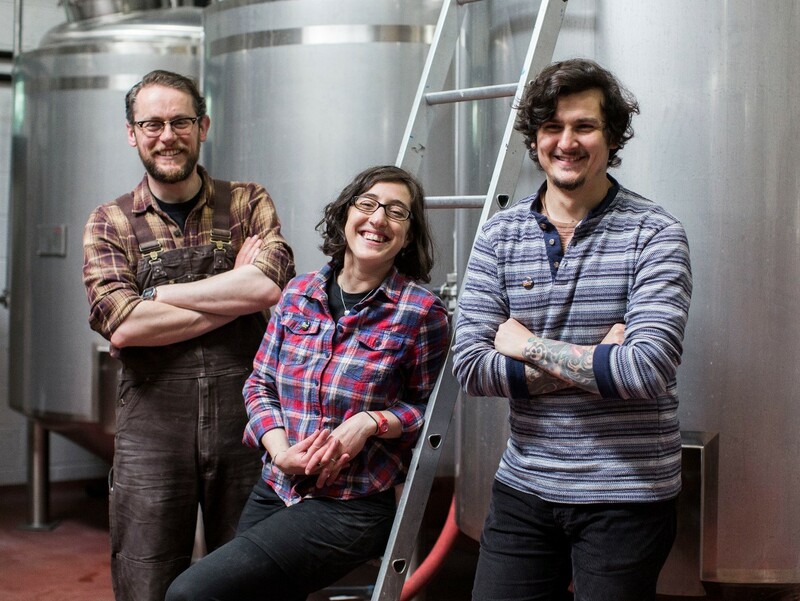 We’re so enjoying being part of the beer and brewing community in Bristol and want to take this opportunity to thank everyone for their support so far – thanks for being part of our story! We thought now would be a good time to reflect on what we’ve been up to in the last year, and mention a few things we have coming up. Our blog has taken a bit of a backseat because we’ve been so busy, so here’s a little run-down of where we are at the moment. The first place to start is our beers! For winter we launched new beers, including Becoming North, Wild Forest and our first Christmas beer Advent Horizon. We were really pleased with these, and had great feedback on them. 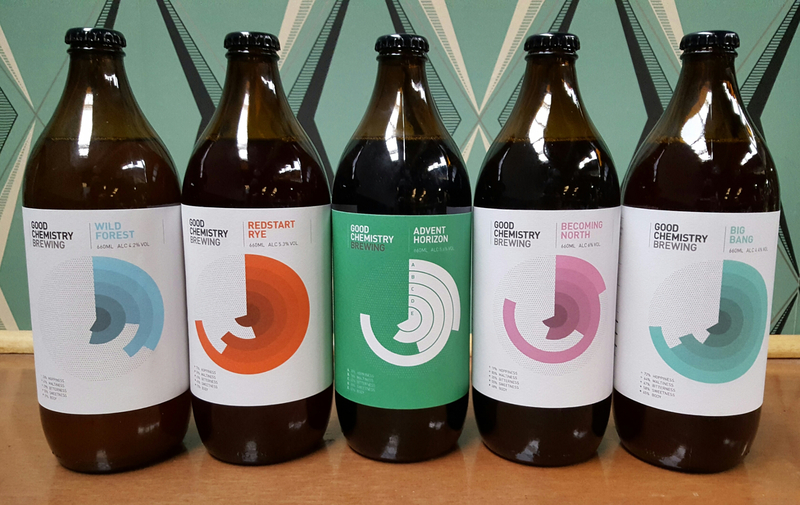 Bringing Big Bang back (for the last time; more to come on that) was pretty cool – it was the first beer we ever brewed back in November 2015, and based on the first beer Bob ever home-brewed, so we love that everyone else loved it too! When summer arrived we decided to continue brewing Wild Forest, our wheat beer spiced with two types of pepper. It’s been hugely popular, both in bottle, out on draught and here in our taproom. Bob’s love of the saison has been well-represented this summer, with Field Work and our modern hopped version Business Casual making a return. 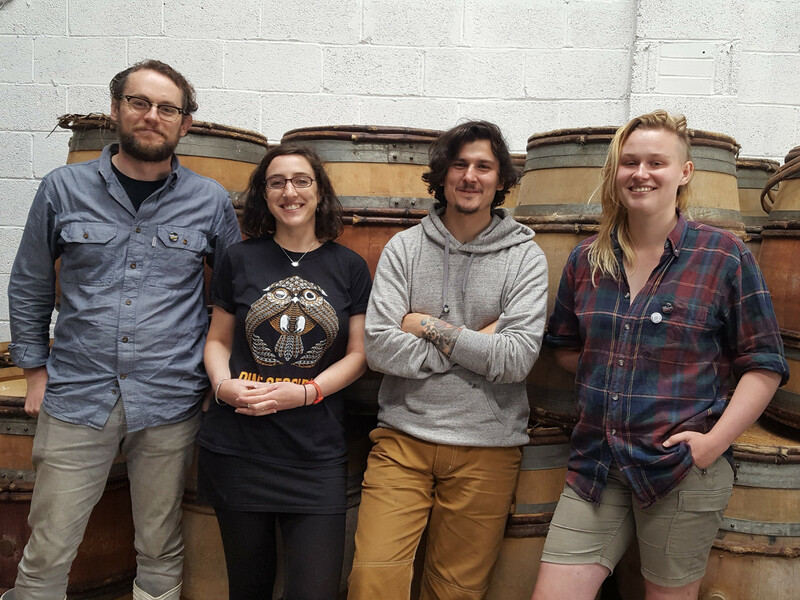 We also recently brewed a small batch sour saison, which has been split four ways on fruit – these will be on at the taproom as well as a select number of venues across Bristol and beyond. Just six months ago, in March, we launched Natural Selection – it feels like a staple already. And, of course, every time we brewed Kokomo Weekend it just flew out! We love this beer, and are so pleased its tropical fruity hoppiness has been embraced so whole-heartedly by you lot! We did collaborations with Bison Beer from Brighton in September (after their epic bike ride here we brewed Ryed With Us); Chris Williams from No12 Easton and 25A Old Market in September (for his exclusive Numbers Game pale); The Gallimaufry on Gloucester Road in April (In Our Nature on cask); and Holy Roar Records in May (6.66% American stout, launched with a gig at Crofters Rights and at Ghost Whale in Brixton). In the last year we’ve also been busy with events. We’ve been hosted by great pubs for tap takeovers at BrewDog in Cardiff last November; the Greenbank in Easton in February (where we launched our sunshine IPA Kokomo Weekend); the fabulous City Arms in Cardiff in May (as part of their monthly pub quiz, where we came third and were the highest placing brewery ever! 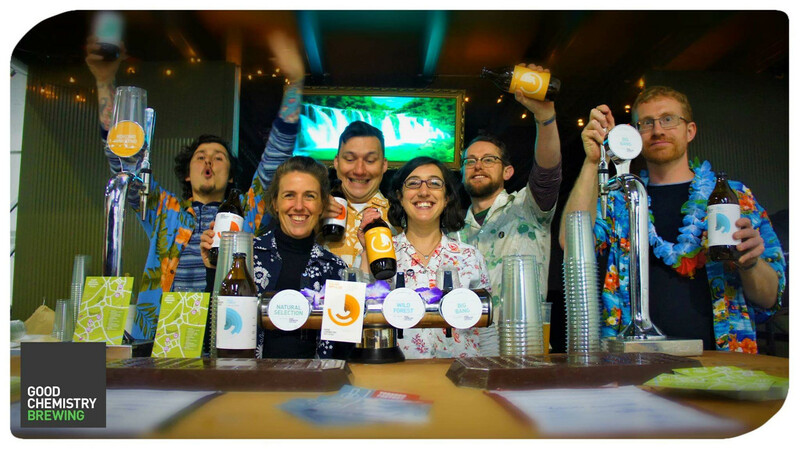 ); our second TTO with our pals at the Tobacco Factory in May (alongside the awesome Bristol Eats collective); and Wild Beer’s first bar Jessop House in Cheltenham in August. We were also involved in the first Bristol Craft Beer Festival at Motion last September (look out for us back there this September). 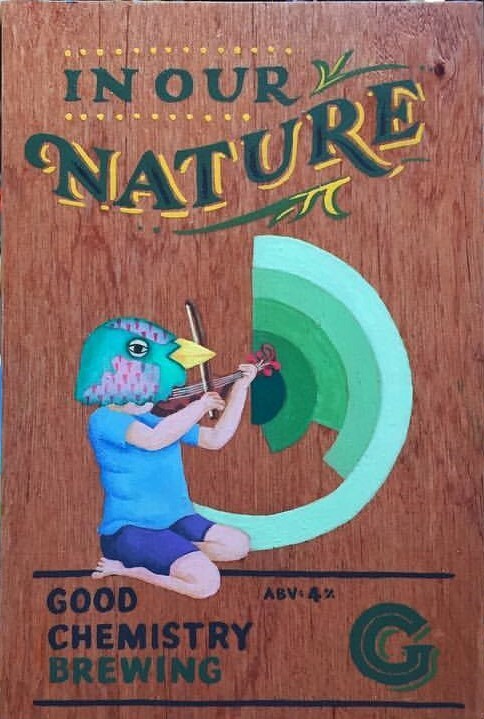 Kelly contributed to Women in Beer at the Wave Maiden in Portsmouth in May and at a University of Birmingham event on The Meaning of Making in June. And we loved being aboard HMS Warrior for Staggeringly Good Brewery’s beer festival on a ship in July. 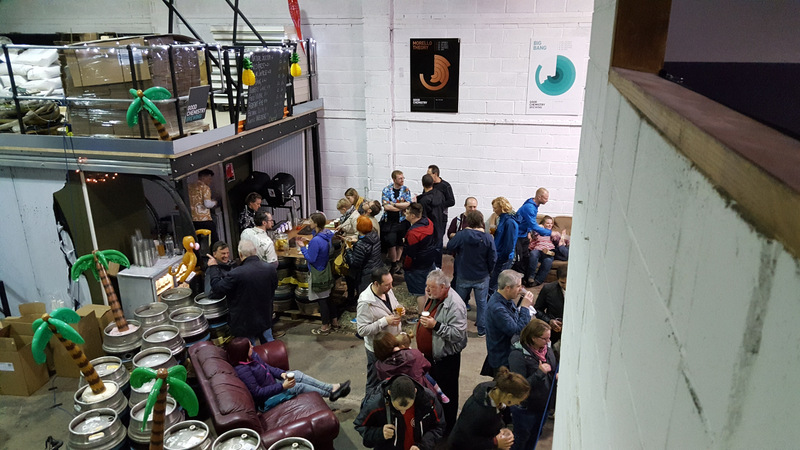 Following the first East Bristol Brewery Trail over the May bank holiday in 2016, we’ve opened up the brewery for loads more events that we have absolutely loved running! Since our first birthday this time last year we’ve done two more brewery trails with our neighbours (the next one coming up over August bank holiday weekend), the Think While You Drink series of academic talks for Bristol Beer Week, our popular Christmas Brewers Market, Pint of Science festival in May and our second Glastonbury weekender. As of this weekend, the taproom will be open through the rest of August and September on Friday evenings and Saturdays. We hope you’ll pop in for a pint or two! Perhaps our biggest change occurred in February: the workforce of Good Chemistry increased by 50% as Sam joined us. With a wealth of valuable experience across brewing, retail and hospitality, not to mention a permanently sunny outlook, he has brought a whole new lease of life to our business, and we are thankful every day to have him on our team. Shortly after our birthday celebrations we become a four-piece, with Sarah re-aligning the gender balance! We’re excited to have her boundless enthusiasm for all things beer-related, and hope her addition to the team can take us to the next level in this adventure! Finally, just to wet your whistles, coming up in the next few months we’ve got lots of other interesting things happening. We’re incredibly excited to be doing our first tap takeover at the Hillgrove at the end of September. 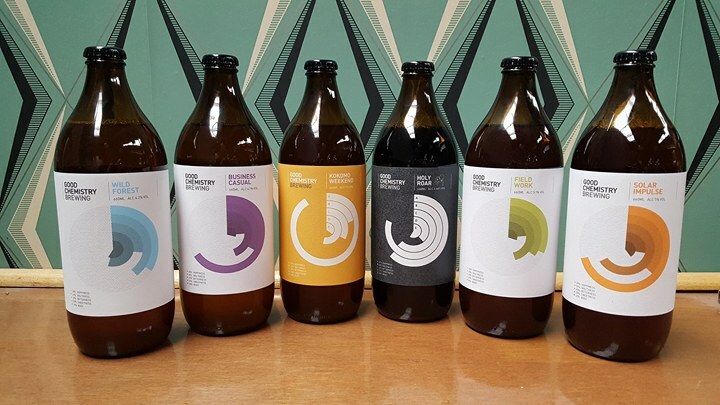 Think While You Drink returns for Bristol Beer Week in October, along with the launch of a beer project that’s proving really interesting to be involved in. And in December we’ll be hosting the second Christmas Brewers Market for all your beery gift needs. This of course goes alongside our seasonal shift to the winter range of beers. We look forward to you joining us for the next year of our wild ride – who knows what we’ll be writing about in another year!